2.6 million e-mails are transmitted annually on the Douglas network. 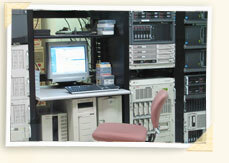 The Computer Departement Help Desk receives approximately 7,000 service requests per year, representing over 20,000 calls received. 1969: The Douglas Hospital installs its first computer for accounting at the Perry Pavilion, marking the beginning of the computerization process. Mr. Leonard Haslam becomes the first manager in this new department. 1976: The Douglas Hospital carries out the acquisition of its first central computer, a Univac 90/30 with a memory of 98K bytes, which represents 0,02 % of the current memory of an office computer. This computer is used for the Douglas Hospital’s financial systems. 1978: The Computer Department introduces its first payroll system. 1983: Data input is done centrally by three appointed clerks in the Computer Department using coding sheets filled out by departments. The Douglas Hospital acquires a new central computer, the System 80 from Univac, in order to allow users to enter data themselves. 1985: The Douglas Hospital acquires its first PC, a Sperry 80/286 with a 640K memory, for the management of donations to the Foundation. 1986: The Douglas Hospital introduces its first word processing software, WordPerfect 4.1. 1987: The Computer Department, in collaboration with the Medical Records Department, performs a massive collection of the 70,000 patient files, thus creating t first electronic patient index. It is the beginning of the introduction of medico-administrative systems. 1988: All of the already existing computer applications are migrated to a new development platform and several other applications are added: Admission/Departure/Transfer, External Services, Pharmacy, Rehabilitation, etc. The server space doubles in order to house all the necessary equipment. Moreover, the Department carries out the deployment of its first fibre optic telecommunications network, connecting the Dobell, CPC, Burgess, Perry, FBC, Newman, Lehman, Reed, Porteous and Bond Pavilions. 1991: The Douglas Hospital acquires its first laser printer, an HP LaserJet 3. This model is used for 15 years, proving its exceptional durability. 1992: One of the first mandates of the new Head of the Computer Department Richard Ouellet consists of concluding an agreement with the firm MédiSolution for the external handling of payroll. 1994: The Computer Department proceeds with the development of a new program, Patient Profile, allowing the cross-referencing of patient information contained in different computer systems. This application is better known today as Médico Windows. 1996: The Computer Department introduces electronic mail (Groupwise) as well as a telecommunications link with McGill University, thus providing Internet access. Some believed that the Internet movement will be just a passing fad. 1997: The Douglas Hospital wins the AHQ Excellence Award for the development of its "Rehab" (Rehabilitation Hall and Baker) software, used to evaluate the degree of a patient’s rehabilitation progress. 1998: Among other projects, the new Department Head Daniel Sirois must make sure that the Douglas Hospital passes Y2K, not only on a computer infrastructure level but also on the level of the physical installations and biomedical equipment. The Douglas Hospital succeeds in obtaining over one million dollars in subsidies from the Régie regionale in order to renew some of its equipment and software. 1999: The Computer Department proceeds to the introduction of the first Help Desk. Several computers are set up for the doctors and wards. 2000: The Computer Department creates the Comité d’orientation des technologies de l’information (COTI), a committee that will take care of prioritising various computer-related projects. The Douglas Hospital changes software from Wordperfect and Lotus 1-2-3 to Microsoft Office. 2001:In order to conform to the Minister’s technological directives, the Douglas Hospital migrates from Groupwise to Lotus Notes for its electronic mail purposes. Additionally, in September of the same year, the Douglas Hospital migrates its telecommunication link to the Réseau de télécommunication sociosanitaire (RTSS), becoming the national pilot in the experimentation of a telecommunications gateway with the university world. Moreover, it also becomes the first Quebec establishment to provide remote e-mail access via the RTSS. 2002: The organization launches its first Intranet version. This brings the Douglas Hospital its second Excellence Award from the AHQ, an achievement that very few establishments in the Health and Social Services Network have attained. 2003: The Executive Office and the Computer Department introduce the first version of the Organizational Balanced Scoreboard. Furthermore, the Computer Department, in collaboration with the Professional and Douglas Hospital Services, deposits a feasibility study for the installation of a Computerized Patient’s Record (CPR). Moreover, the Computer Department begins a project aimed at improving its customer service by establishing the best industry practices in the management of information technologies. This project requires a major reorganization of the Help Desk. 2004: The Douglas Hospital proceeds to a major reorganization regarding its information technology, thus creating a new Information Resources Department (DRI). This new entity includes activities related to information technology and the Organisational Balanced Scoreboard. The Computer Department takes an active part in the deployment of a new telecommunications network to the Perry Pavilion, made possible thanks to a CFI subsidy obtained by the Research Center. The Douglas Hospital sets up a computer training room at the Newman Pavilion, as well as a videoconference room at the Douglas Hall. 2005: The Douglas Hospital proceeds to major technological introductions : digital dictation, SIURGE (Système d’information pour l’Urgence) and Med-Echo+, the latter in order to conform to CIM 10, the new classification of diagnostics. A fibre optic link is installed between the Douglas Hospital and the Étape and Levinschi Pavilions, hence totally eliminating the last telecommunications by antenna. 2006: The Douglas, now a University Institute in Mental Health, completes the establishment of its digital dictation project by deploying Transcription and Electronic Signature modules via its application called SAM (Système d’accès multidisciplinaire).